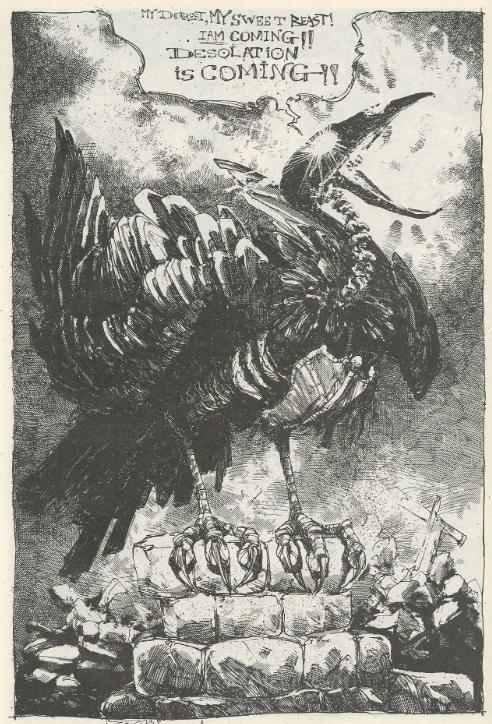 Carrying the talisman of the fallen Turtle, a crow flies into the city. The Shredder sits by the window of his headquarters, removes his mask and considers how the mask is his true face. The crow, with the talisman in its mouth, appears at his window. Shredder recognizes the talisman and is disturbed that “the rat” would be playing with such powerful forces. The crow then taps the talisman against the window and there is a great explosion. Down in a basement, the Turtles lay their dying brother on a cot and pile wreaths of flowers over him. Splinter tells his sons to be careful and follow the ritual’s instructions precisely. Splinter creates a circle in the grime and uses a sword to summon Animus, a skull-headed god of animal life. Animus is furious that Splinter would dare summon him with iron, something of man’s make. Looking at the rat-man, though, Animus is curious and considers the creature to be some sort of riddle. At Foot HQ, the Shredder recovers from the explosion. He realizes that the rat is making a mistake and that the powers he is playing with are, in fact, playing with him. He decides to confront Splinter face to face and vanishes into thin air. All around the city, crowds of people are overcome by a strange, supernatural calmness in the air. All except a man yelling at his girlfriend. The Shredder appears to him and seizes him by the throat. Before vanishing again, he gives the man a piece of free advice: “love one another”. In the basement, Splinter requests that Animus perform a favor for his children. Animus says that Splinter walks and speaks like a man. And worse yet, he summons him with iron. Animus says that neither Splinter nor the Turtles are his children and vanishes. As Splinter crumbles in despair, several rats scurry up to him with news that the Shredder is coming. Splinter rallies the Turtles to hide and wait. They are weak and sleepy, but he says that they must fight it in order to save their brother from the Shredder. Shredder appears on the roof of an old apartment building. He traverses the corridors down to the basement and enters the room where Splinter and the Turtles are holed up. Splinter orders his sons to kill the Shredder, but they are too weak and he easily casts them aside. Shredder then approaches the dying Turtle and, using his mystical energies, revives him. As Shredder leaves, Splinter asks why he would help him. Shredder replies that “everything beautiful bleeds”. At Foot HQ, the masked geisha orders the Foot Soldiers to clear the rubble before their master returns. Suddenly, from the wreckage, a blast of energy overcomes them. A glowing, skeletal crow claws its way out, declaring that “desolation is coming”. *The story is continued from TMNT (Vol. 1) #31. The story concludes in TMNT (Vol. 1) #36. *This issue also contained a guest introduction, “Cowabunga and the Zen of Turtle Maintenance” by Stephen R. Bissette. 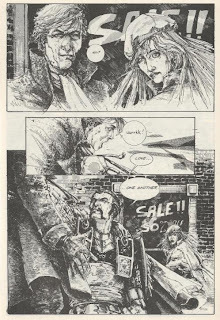 As Murphy’s name is not listed in the credits, I’m not sure if he scripted this issue as he did the first installment in the “Souls Winter” trilogy. The introduction by Steve Bissette exclusively credits Zulli with this story, so I’m left to assume Murphy wasn’t involved in this chapter. Zulli’s script for this part could probably have used a little extra polish, as the motivations for certain characters (namely, the Shredder) seem rather muddy. After nearly having the Turtles killed, Shredder seems to have this great revelation that all life is precious and beautiful, then proceeds to undo the damage he’s done… but the impetus for that change of heart seems rather out of the blue and hurried. It could also be construed as an “enemy of my enemy is my friend” scenario, as he immediately recognizes what the crow with the talisman represents and, following the explosion and the psychic energy permeating the air, realizes he must get Splinter and the Turtles back to full health no matter what. 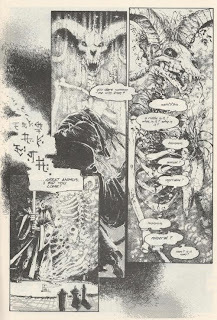 The fact that he still calls Splinter “freak” would indicate a retained sense of animosity, though I suppose that that’s diluted by the end when he makes his “all that bleeds is beautiful” statement. A little confused, but you can pick out the intent with some reflection. What I liked more than anything about this issue was Splinter’s scene with Animus. Splinter is sort of like a “mixed race”; the human world, represented by the Shredder, won’t accept him, and the natural world, represented by Animus, won’t accept him either. You can feel his despair and helplessness as Animus abandons him and he has no means of saving his son’s life, and it really is a powerful scene (with a hint of dark humor, as Animus chides Splinter’s lack of manners for using iron to summon him). That the scene is followed by a desperate and enraged Splinter calling for the Shredder’s grisly death is even better, as you finally get to see the old rat backed into a corner and with nothing left to live for but his hate. A very atypical view of Splinter, but one that doesn’t feel particularly out of character despite this being an alternate continuity tale. 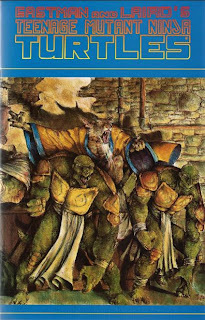 Although this comic is called “Teenage Mutant Ninja Turtles”, the “Souls Winter” trilogy isn’t really about them. It’s a tale of Splinter vs. Shredder and the world of man conflicting with the world of nature. 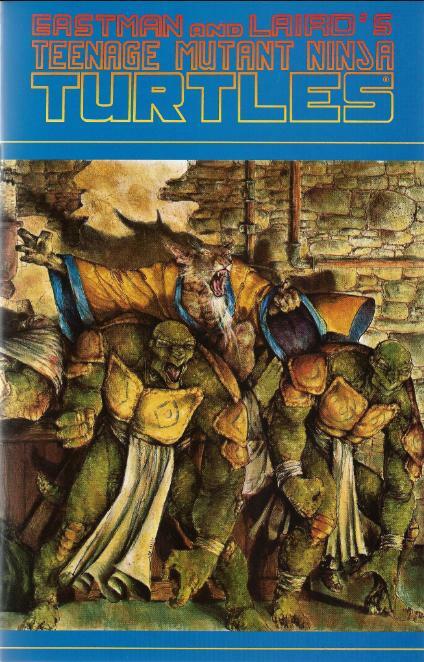 The Turtles, all identical and devoid of names or unique characteristics (the chest markings they had in the first chapter are gone in this one), really are not the focus and tread into “non character” territory. While that might annoy some, I’m somewhat grateful that the focus is shifted to Splinter’s grudge with the Shredder. Without the Turtles to get in the way, we can actually see the two old enemies confront one another (a scenario never utilized in the Mirage comics, save Splinter meeting the Shark Shredder, which only kinda-sorta counts). And, of course, Zulli’s art is amazing. Damn, but that guy draws some amazing skeletons. What I love about this issue is the almost "heroic" qualities given to Saki that make him much more complex as a character. Despite being a ninja leader, he is almost "pure" in his motivations. I love the "love one another" scene, as if he is more fed up with man's pathetic squabblings than anything else. It is unknown in this continuity the cause of Splinter and Shredder's animosity, but it seems more based in their species differences (Shredder's continued "freak" epithet). Shredder stands for "man" and seems to be fighting Splinter more to defend man than anything else. His references to Splinter as "the rat" remind me of his portrayal in the first TMNT movie, which bettered Mirage at least in having Shredder and Splinter come face to face. Animus is great. It (and the next issue) really address the issue head on -- what are the Turtles? Whose side are they on, specieswise? The McCollum/Anderson "Ring" stories tackle similar thematic ground, albeit from an "in-canon" perspective.